Hi friends...I hope you all had a wonderful Christmas! We sure did...we are still hosting Christmas visits with family! I love this time of year!! I put together a little review of all the projects that went on over here at Northern Nesting this past year...let's take a look. 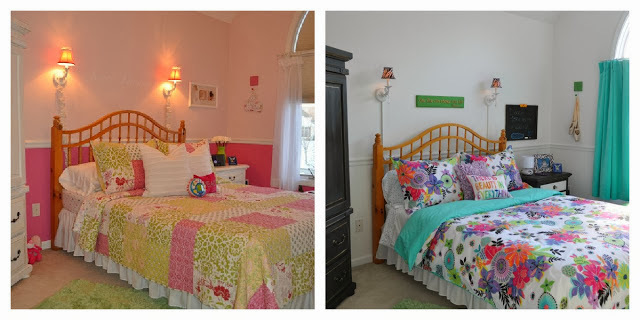 I started the year off with a room makeover for my oldest daughter Mackenzie...not only were the walls painted a new color, but all her furniture was updated with paint too! AFTER...using AS chalk paint in pure white. The mirror was also done in pure white. Next up was her armoire...I painted this before my blogging days and before I knew about chalk paint! AFTER... again using AS chalk paint in graphite. Back in March my bedroom was featured in Romantic Homes magazine...talk about being THRILLED!! In May we adopted our new pup Neena...she is such a sweetie! Our home wouldn't feel complete without a dog! A little makeover that I still love looking at is this little footstool. AFTER...adding a little cheetah print. 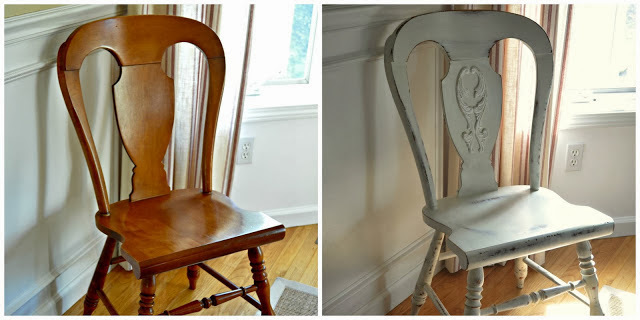 Another makeover was this chair my mom picked up for me at an estate sale...I used Miss Mustard Seeds milk paint on this piece in Ironstone...I even added a wooden applique to dress it up a bit. It's home for now is in our dining room. Next up is the new chandelier in our dining room... the hubby bought it for me for my birthday...LOVE IT! I painted the medallion to match it. My living room was something that I worked on for months...adding pieces that I absolutely love to give the room a casual, collected over time look. and the new pillows made by Ann On Sutton Place Designs...love them!! The purchase of this wool rug has to be my favorite! Another room makeover I did this past fall was in my son Will's room...taking it from a young boys room to a pre-teen room. AFTER...we added a beadboard accent wall...new paint color on the walls...and new bedding. Last but not least I freshened up our powder room with paint and framed these new botanicals for the walls. Thank you for always popping in to see me and always leaving me the sweetest comments...they truly make my day! Wishing you all a very Happy New Year! Wishing you all my Friends...Peace...Joy...& Love...this Christmas Season & throughout the New Year! I'm so excited to share our family room all decked out for Christmas with you! This is the room we always hang out in so I go all out! I love this years tree...it's an 8 1/2 ft. Fraser Fir. Our mantel is similar to last years being I hung a real wreath in the frame but I switched out what's around it. You can see last years here. My mom bought me these white wooden deer, she found them in Cracker Barrel this year...they're so pretty! My youngest daughter picked this stocking out at her schools Christmas shop last year for our Toby...now our new pup Neena will use it. Christmas in the Family Room 2013! 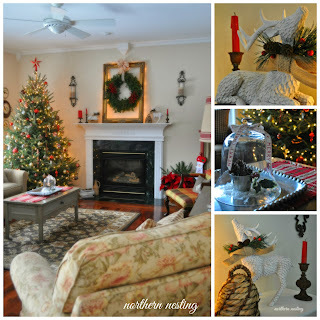 Today I'll be sharing Christmas in the Dining Room! Like I mentioned before this year I used all fresh greens. I lucked out when taking these shots...we haven't had to many sunny days lately! Love the variegated leaves on this poinsettia plant...and you can see where I used the other pinecone candles that I bought. 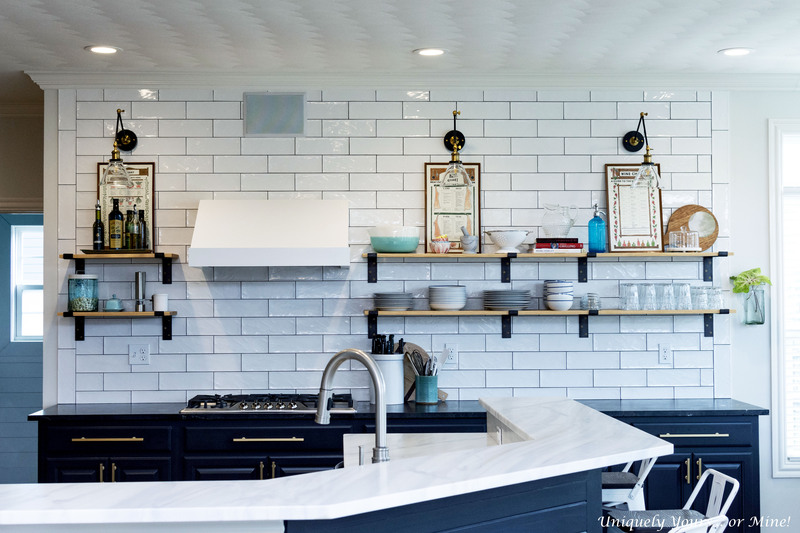 I found these pretty dishes in Home Goods last year and forgot I had them...love when that happens! I just added my glittery Santa's along with greens and pinecones. Found this cute tree garland in Target. Thanks so much for stopping by...hope you enjoyed the tour!